What is a TED-Ed club? TED-Ed, is a way to celebrate the ideas of students around the globe. Through TED-Ed Clubs, students — with the help of an adult facilitator, (Reetika is the facilitator for TED-Ed Ludhiana) — identify and research the ideas that matter to them most. And while TED-Ed Clubs offer students the opportunity to connect with others who, like them, are unabashedly curious about the world, TED-Ed Clubs are also about presentation literacy. TED-Ed Clubs offer students a hands-on opportunity to work on the storytelling and communication skills that will be vital, no matter what career path they end up strolling down. 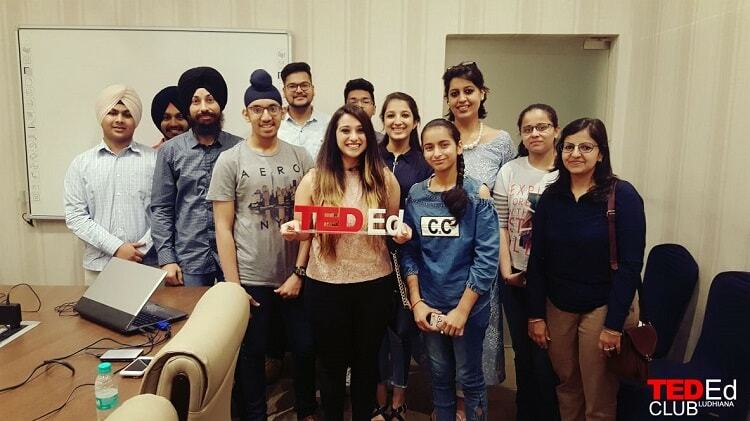 And TED-Ed Club Ludhiana ensures that it keeps on providing students with as many opportunities as possible, the latest being an internship program for school and college students where through the platform of TED-Ed. What will the students learn from the internship? The internship is an amalgamation of practical and theoretical knowledge where students through workshops and on ground experience learn offline marketing and digital marketing ,publicity, leadership, sales, Public relations, brand management. And they get certifications, letter of recommendations and real time experience to show for it. We, as Gedhi Route, took two workshops with the students – one on Social Media Marketing and another on Digital Marketing to give them an insight into how marketing in corporates and for brands really works. But the agenda of TED-Ed clubs is primarily providing learning opportunities not just for students but for everyone. Truth be told, aren’t we all students at the end of day? And this is why the WOW Meet 2018 ( World of Words) is important for all of us to attend. The WOW Meet 2018 brings to Ludhiana 4 stupendous TEDx speaker from different cities and walks of life. Imagine the exposure one would get listening to those speakers in person and the best part is that the attendees (read students) would get to share their ideas and perspective on stage as well. In case you are wondering who the speakers are, here’s a sneak peak. But that’s not it. As we said, TED-Ed Club Ludhiana is focussed on providing opportunities for everyone. In addition to the WOW Meet, they have something in their kitty for Start-ups and start-up enthusiasts – The launch of eChai Ludhiana in association with TEDEd Club Ludhiana to encourage Entrepreneurs from Ludhiana to connect, share, Collaborate & CoRise. The purpose of the platform is to play to provide advantage to Entrepreneurs in Ludhiana. They’ll present their ventures, get early feedback and engage with the Entrepreneurial community fortnightly. The launch is an invite only event. The entry to the Pre-event is restricted to ticket-holders of TED ED Ludhiana WOW meet. If you are pretty pumped up after reading this we suggest you buy tickets to the WOW Meet immediately.